The President of World Sailing, Kim Andersen, has issued his December Presidential Newsletter, with a large section focussed on explaining the decisions on Olympic events and equipment and how they were achieved. There is one area that has been a focus of discussion throughout the year – the decisions on Olympic events and equipment. This topic has been challenged throughout the year and has been testing the processes that are currently in place. The Annual General Meeting supported the decisions made by a clear majority and undoubtedly confirms that our governance processes are intact. I truly believe that if we all have a clear understanding of the decisions being taken for the future of our sport and the new initiatives being implemented to advance sailing, we will be stronger. This is evident by the achievements made already this year. 2018 has been a great year for World Sailing, from working on our governance standards to improving our gender equity as well as expanding the development of our sport worldwide. 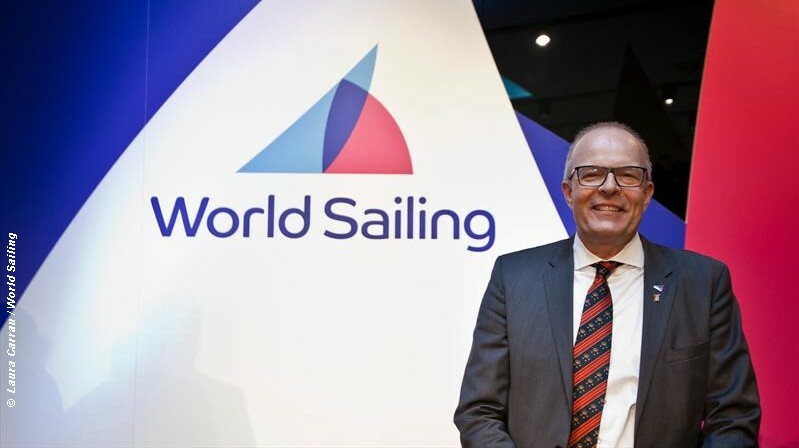 It was also the year of the combined worlds, with the Hempel Sailing World Championships which took place in Åarhus and made such a positive impact on all parameters, and what with the launch of eSailing, attracting new audiences and sponsors, and most recently launching the World Sailing Trust, we have achieved many goals! And as we look to the future, I know that we are setting sail in the right direction to accomplish even greater achievements for next year. As we close another great year together, I would like to wish you all a very happy holiday season – stay safe on the waters and get ready for a busy and exciting 2019! The section of the World Sailing Presidential Newsletter posted below is that covering the the decisions on Olympic events and equipment that Mr Andersen refers to in his introduction above. The full December Presidential Newsletter is available on the WS website here. At the World Sailing Annual Conference, the World Sailing Board made a late submission regarding the Mixed One-Person Dinghy Event, Submission 037-18. The reason for the late submission came from the expressed concern of the Member National Authorities (MNAs) and a detailed explanation was clearly outlined to Council and Committee members. Many of our Member National Authorities expressed concerns that the Mixed One-Person Dinghy Event would not work as a format and the selection of the Equipment would not be possible. The MNAs, therefore, asked the Board to give guidance to Council in order to resolve this matter. The World Sailing Board made this a priority. On the first day of the Board meeting, ahead of the conference, the Board spent one day going through all the options available for the Events in question, which resulted in the Board agreeing to a late submission. The late submission was then made available at the earliest possible time, immediately after the Board meeting that same day, which was the start of the Annual Conference. The submission was launched at that time in order to make sure that it could be a part of the full Committee process leading up to the Council meeting at the end of the week. At the Council meeting, submission 037-18 needed 75% of votes to be passed: it received 79% and was approved by Council. It was then submitted at the Annual General Meeting and required only a simple majority to pass – it received 78% of the votes. It is very clear that the minutes in question reflect the true actions and decisions from the meeting, in particular the actual voting at the meeting, and not the intentions of individuals before or after the voting process. Therefore, I would like to refer to the minutes of the World Sailing Council and Annual General meeting: http://www.sailing.org/meetings/2018-conference.php. While some individuals believe that the intentions of the Board are not in the best interest of sailing, I would like to say that if the intentions for the late board submission were as bad as some of the accusations, an alternative route for the submission 037-18 could have been to make it only available for the AGM vote. This would have bypassed the Committee structure and Council in the process, avoiding the 75% majority vote in Council – personally I don’t think this would have been an appropriate or transparent way forward. Lastly, in the event that submission 037-18 had not been approved in Council, some of the MNA’s in favor of the proposal would have carried the submission forward to the Annual General Meeting. For example, the French MNA had already made a submission to the Annual General Meeting before the council meeting. Nonetheless, the results of the vote at the Annual General Meeting was clear – 78% in favor when only a simple majority vote was needed, the majority were clearly in favour for the submission and it has been approved. Furthermore, I would like to say that whilst this one vote has been the centre of many misinformed discussions, there were also a lot of other decisions that were made at the annual meeting in Sarasota. For those interested in those additional decisions, they can be read in the published minutes from the Council meeting. In addition, more background information for the selection of Events and Equipment for the 2024 Olympics can be read in the “Report from the President”.